We have stepped towards unlimited success and the credit goes to our entire team who has spent their time and efforts to make us stand in stiff market place. 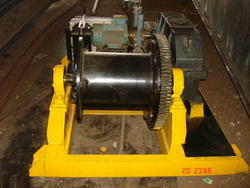 Our Product Electric Power Winches, has found a large number of users who have appreciated the quality of this product. Design: Power Driven Winch Machines are designed as per IS-9507-1979 and are suitable for heavy Duty applications. 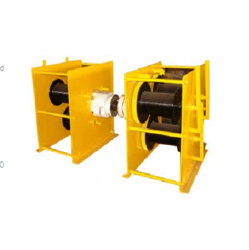 Generally, Winches with Right Hand Operation are manufactured; however, the same can supplied with other side operation also as per requirement. Base Frame: Fabricated with I.S.M.C. & C Sections/Plates property ribbed, floored with checkered plate platform for working area, lifting lugs, Anchoring Holes for foundation, provided. Reducer: 1st stage reduction with self made Helical Reduction Gear box or of reputed make & other reduction with open Spur Gears & pinions. Motor: High Starting Torque, Class 'B' Insulation, 150 Starts/ Hr415V, 50Hz, 3 Phase, A.C. Induction, squirrel Cage/Slippering motors conforming to IS-325 of reputed make like NGEF/Crompton/BBL/BHT etc. Control & Control Panel: The winch is operated by Push Button Station/Controller at 110V. fixed on machine. The control Equipments like Triple Pole Reversing Contractors, H.R.C. Fuses, pilot lamp etc of reputed make like ABB/BCH/SIEMENS. Brake: Electromagnetic/Elector Hydraulic thruster, Double Shoe Type Brake and/or Hand Operated brake provided as per requirement. Improvement: We reserve the right of effecting any technical improvement without any notice. Our Portable Power Driven Winch Machines are designed as per IS-9507-1979 and are suitable for heavy Duty applications. 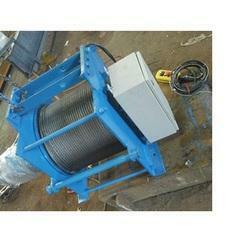 Generally, Winches with Right Hand Operation and Left Hand Operation are manufactured as per customer requirement. Rope Drum used are steel fabricated Drum that are duly machined, with flanges at both ends. Drums with larger (>100 metres) winding capacity are also available. Motor being used has high starting torque, Class 'B' Insulation,150 Starts/ Hr415V, 50Hz,3 Phase, A.C. Induction,squirrel Cage/Slipring motors conforming to IS-325 of reputed make like NGEF/CROMPTON/BBL/BHT etc. Brakes used are electromagnetic/elector hydraulic thruster, Double Shoe Type Brake and/or Hand Operated brake provided as per requirement. Power Driven Winch Machines are designed as per IS-9507-1979 and generally, Winches with Right Hand Operation are manufactured, however , the same can be supplied with other side operation also as per requirement. The base frame of this machine is fabricated with I.S.M.C. &C Sections/Plates property ribbed, floored with checkered plate platform for working area, lifting lugs, Anchoring Holes for foundation. Rope Drum used is steel fabricated drum duly machined, with flanges at both ends. Drums with larger winding capacity (>100 mtrs) can also available. Motor used is with high starting torque, Class 'B' Insulation,150 Starts/ Hr415V, 50Hz,3 Phase, A.C. Induction,squirrel Cage/Slipring motors conforming to IS-325 of reputed make like NGEF/CROMPTON/BBL/BHT etc. Brakes used in these machines are Electromagnetic/Elector Hydraulic thruster, Double Shoe Type Brake and/or Hand Operated brake provided as per requirement. Discovering an exceptional and innovative perception in the field of manufacturing Wire Rope Winch Machines has enabled us in acquiring a huge base of clients across the globe. Premium quality raw material is used to manufacture these products, which our procuring agents have sourced from the reliable and certified vendors. We make sure our clients that our products are in conformation with the industrial suggested guidelines and norms.